My friend and Top Suspense colleague Dave Zeltserman is a dual threat — equally adept at writing terrifying, and deeply unsettling horror novels as he is at writing stunning crime novels. His latest horror tale, The Boy Who Killed Demons, earned a starred review from Publisher’s Weekly and raves from both Kirkus Reviews and Library Journal. I invited Dave here to talk about the influences that shaped his new book. Every author has influences we’re aware of for our books, and sometimes we have subconscious influences that we might become aware of after the book’s been written. My first novel, Fast Lane, was heavily influenced by the great crime noir writer, Jim Thompson, even when I wasn’t aware of his influences. My crime novel, Pariah, was consciously influenced by the Whitey Bulger crime saga and a well-publicized plagiarism scandal involving a chicklit book. My Frankenstein retelling, Monster, was obviously influenced by Mary Shelley’s Frankenstein, but also by the Marquis de Sade, the German horror writer E. T. A. Hoffmann, and John Polidari’s The Vampyre. While I wasn’t aware of any influences on my crime noir novel, Small Crimes, years later I could see Dan Marlowe’s influence in my writing. 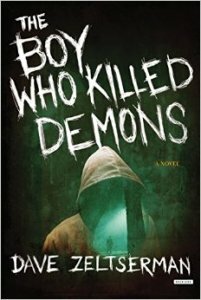 With my latest horror novel, The Boy Who Killed Demons, that’s being released today, there are obvious influences by Lovecraft, the film They Live, and Spider-Man. The Boy Who Killed Demons chronicles the struggles of 15 year-old high school student Henry Dudlow to keep the world safe from demons. When Henry was 13 he was a normal, outgoing kid, but then he started seeing certain people as demons, and things change dramatically for him. After convincing himself that these really are demons, he sets about to determine what they’re up to, and when he discovers that they’re trying to open the gates to hell, he has to do whatever it takes to stop them. When I was a kid I read all the Lovecraft I could get my hands on, often (as Henry does in the book) riding my bike into Boston to visit used bookstores. While stylistically The Boy Who Killed Demons is very different than Lovecraft’s writing, the influences can still be seen, both in the way I sometimes show Boston and with the forces at work to allow evil, all-powerful entities into our world that will cause the destruction of everything we know. One of my favorite horror films is John Carpenter’s They Live, and Demons gives a nod to the film as Henry watches it on TV one night and identifies strongly with Roddy Piper’s character, and the sacrifices Piper must make once he can see the aliens for what they are. Finally, there’s the Spider-Man influence. As a kid, this was my favorite comic book, and Henry keeps watching the first Toby Maguire Spider-man for inspiration, identifying strong with the ‘with great power comes great responsibility’ idea, and later in the book the first Spider-Man comic book plays a role.